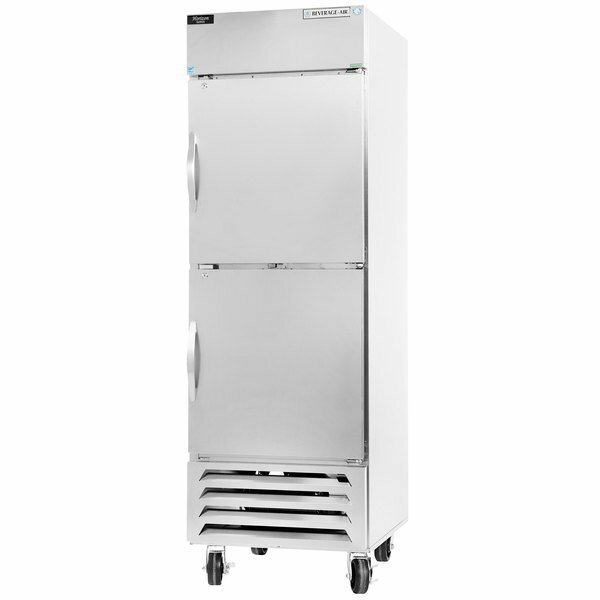 Built for back of the house storage, the Horizon Series bottom mount reach-ins from Beverage-Air offers a variety of refrigerators and freezers perfect for any food service operation. The units range from 27" to 75" wide to provide an assortment of sizes. While solid, glass, full, or half-door options are also available. For maximum durability each unit features an all stainless steel construction. Bottom-mount refrigeration is ideal for back of the house use. Raising the interior floor for easy loading and retrieval. It also makes it safe to store supplies on the top of the unit. The Horizon Series have a 1 piece grill for easy cleaning and an electronic control for intuitive operation. To accommodate unique needs, dual temperature units are available with both refrigerated and frozen cabinets. All freezer units feature a built in expansion valve for reliable high quality performance. Each Horizon unit features bright interior LED lighting which makes it easy to locate your products. These LEDs emit far less heat than regular fluorescent lights, which is ideal for a refrigerated unit. The doors are also outfitted with a 120 degree stay-open feature for easy loading and a self-sealing design with magnetic gaskets for secure closure. Solid doors even boast anti-microbial handles and locks. Inside each unit are 3 heavy duty epoxy coated shelves per section, which are adjustable in 1/2" increments. Built for a busy commercial kitchen, bottom mount Horizon Series reach-ins are all tested to perform in an ambient temperature of 100 degrees Fahrenheit. 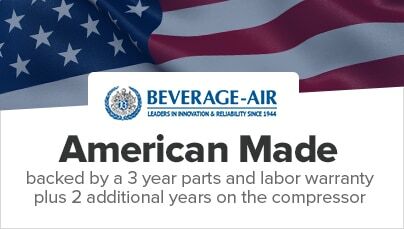 They're also Energy-star qualified and proudly made in the USA. Get to know the Horizon Series of Beverage Air's reach-in refrigerators and freezers and the many perks that they offer! 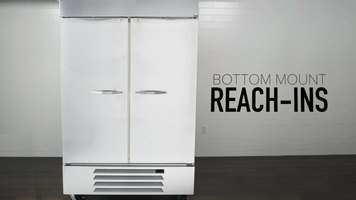 Increase your cold storage space while maintaining a sleek, professional appearance with the Beverage-Air HBF27-1-HS 30" bottom mount Horizon series reach in freezer with two solid half doors! Made with stainless steel inside and out, this freezer is built to last. It has an electronic thermostat with a manual defrost option and a simple key pad that allows you to easily adjust the temperature as needed to keep foods at the proper temperatures. LED interior lighting allows for optimal product visibility. Its bottom mounted, balanced refrigeration system allows for better ergonomics since it raises the floor of the unit for easier access, and it also makes it possible for you to store other items like paper products, oven mitts, or food pans on top of the freezer. The refrigeration system uses environmentally friendly R-404A refrigerant and a 3/4 hp compressor to keep the interior of the unit at 0 degrees Fahrenheit. The condensate evaporation system is automatic to allow for greater energy efficiency, while the evaporator is epoxy-coated to prevent corrosion and ensure a longer product life. This unit has two solid, half-sized self-closing doors with spring loaded hinges. The doors also feature anti-microbial handles and door locks to keep your inventory safe and secure. Plus, these doors also have a stay-open feature that holds the door open at 120 degrees while you load and unload the unit. Finally, the doors also have plug in magnetic door gaskets that ensure a tight seal to prevent energy loss and also are easy to remove for cleaning. Three heavy-duty epoxy-coated wire shelves are included, along with four shelf clips for each. The shelves are easily adjustable in 1/2" increments to make sure that you can store everything you need and organize your freezer to suit your storage needs. This unit also includes four 6" heavy-duty casters, two locking, to make it easy to move for cleaning purposes.